Levy, just above the drop zone in 17th spot in the SSML Premier, need to get something out of their last three games to avoid relegation, with London Tigers and Stotfold now in striking distance. Any hope of the required points coming from Saturday’s match started to evaporate early, with the hosts taking the lead in the fifth minute. Levy keeper Ryan Schmid went up to claim a corner, but couldn’t hold onto it and Tyler Ingram pounced on the loose ball to shoot home. Three minutes’ later Schmid did well to save with his legs to keep out a shot from big striker Nimi Ajigbolamu, who was a problem for The Green defence all afternoon. 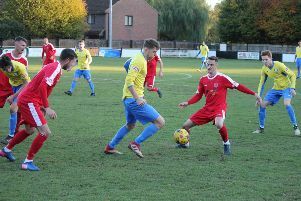 Leverstock’s best chance came in the 11th minute when a corner from Lewis Collins found the head of Reece Cameron, but the header was saved on the line by home stopper Daniel Gould, who was not greatly troubled for the rest of the match. On 26 minutes Ajigbolamu had another run at goal and looked set to score, but his shot was cleared off the line by Luke Nugent. Schmid saved a shot from Danny Watson on 32 minutes, but four minutes’ later Watson got on the end of a cross from Mark Bunker to shoot home from close range. Any faint hopes of a second-half Leverstock comeback were extinguished in the 48th minute when Phil Draycott shot home to make it 3-0. The fourth goal arrived in the 61st minute from the penalty spot, Watson netting his second after Schmid had brought down Ajigbolamu. And three minutes’ later Draycott registered his second as the home side threatened to run riot. Fortunately that was the end of the scoring, so there was no further damage to Leverstock’s goal difference, which could still be an important factor in the relegation scrap. 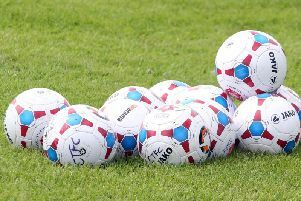 They are due to visit seventh-placed Potton United tonight (Tuesday) as the Gazette was going to press, then host title-chasing third-ranked side Hadley this Saturday. Their season ends with a trip to mid-table side Leighton Town on Saturday, April 27.